I need desperately an idea for a casual sporty waistcoat. Jeans style maybe? Fabric is a light demin with some elasthan. My client (stout) wants it NOW - the weather is very hot now. I think about not lining it. He wants much pockets, Any pics? or ideas? Depends on how many pockets I guess. External face stitched pockets with diagonal bottom corners, lower front each side with open tops, upper pockets front with button down flaps, maybe extra side pockets if that is what he is after. Use the metal buttons that are used in jeans that you fit with a hammer (pin from the back hammered in). Thread suggestion for a darker demin is a natural (off white) in size 80. 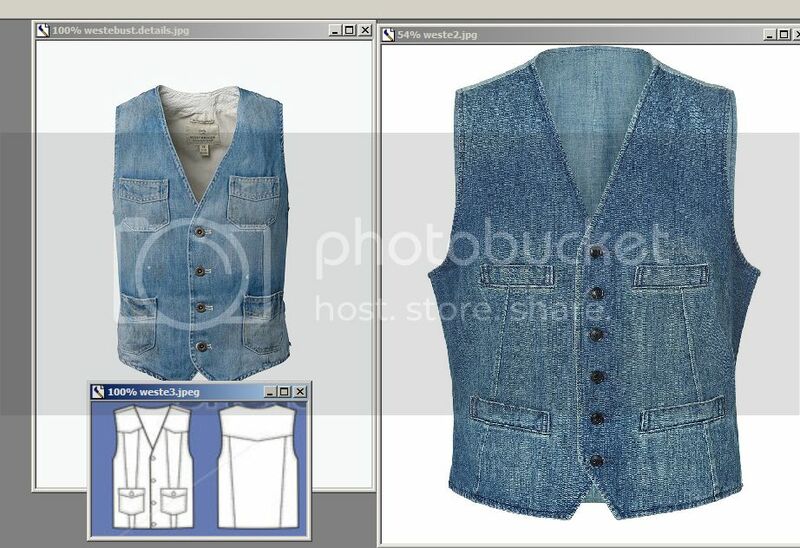 (120 is the normal thread size for that sizing system) and it should end up a very masculine looking vest. Thanks for your help. After I've seen on Google fishermen waist coats, it is clear he only gets 4 decent pockets from me. Otherwise he will cram everything into. I'll use the off white thread even the fabric is a lighter blue. 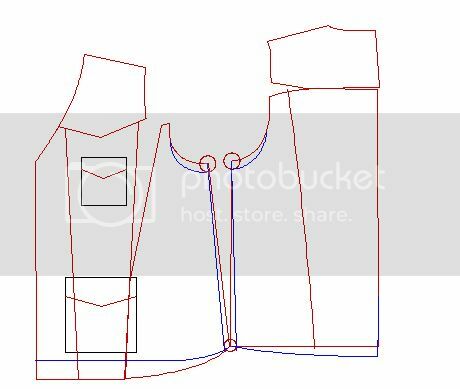 I have found 3 models from which I will develop the waistcoat. I must plan for a wedge. Dont forget 2 inside pockets, one on each side. First I wanted to sew a pocket on the left side under the outside pocket. So there is a pocket but very clean looking and you can not see it from the out side. I asked him about it but he was satsified with 4 pockets. Good! He has a very difficult figure and I had to do those alterations later I draw in blue. I'm not able to measure him - he can not stand some minutes. This time I guessed wrong. He has a bad hanging side too, I did this on the fabric. I came up with this pattern. I doubled the yoke with shirting and did facings front and back neck. I bias bind the armhole but maybe will alter this back to facings. The facings I did with Hongkong finishing. Looks now clean and tidy inside with out much weight. The seams are fell seams which give stability.